As most of you know, there hasn't been much time for cooking and baking lately. So, I've been eating store-bought granola. Go ahead, guffaw! 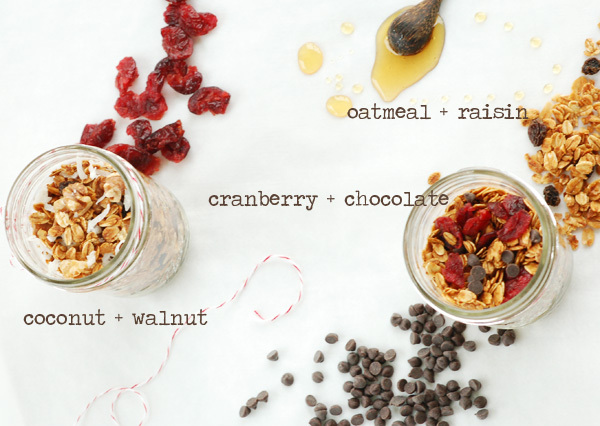 As this is a food blog and I'm talking about store-bought granola, I do have a point and don't you worry your pretty heads, you will be getting my homemade granola recipe (again)! This morning, I had my bowl of granola and heard my little one awake, so I went in and cooed with her and set my bowl of granola on the nightstand and KABLAMO my bowl spilled...sticky, drippy milk and soggy granola everywhere! On a pre-baby day, this would be no problem to clean up, but now that I'm a mamma, oh my...bambina started to fuss a little and I managed to keep her entertained with my whirling around and blotting up the mess with paper towels. This held her attention for about two minutes and she soon realized that this whirling around had nothing to do with her, so she let out her little roar for me to pick her up; I gathered her up into my arms and then the next little roar, which translated to "more breakfast please!" I decided messes can wait until later...as can homemade granola, but if you are up for it and don't have a newborn at home, go for it! If you have a toddler, they can help!